Back in 2007 and 2008 I wrote a couple of posts about the Italian Jesus film Christus. At the time there was a bit of a problem with what the date of the film was (was it 1914 or 1916?). As part of my research on Italian Jesus films I've been looking back at this film again, and it turns out that there were two different films called Christus one released in 1914, the other in 1916 or maybe even 1917. I guess it's time for another instalment of Silent Bible Film Mysteries. Firstly there is some confusion as to who directed which film. 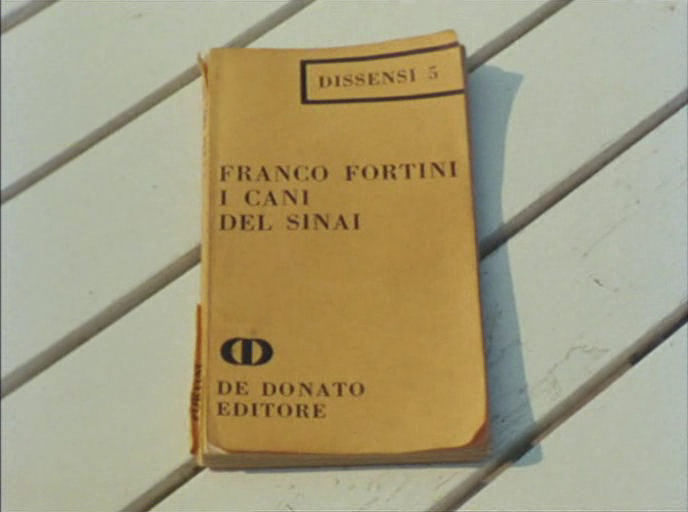 The cover of the DVD I have, cites Giuseppe De Liguoro as the director, but the film itself does not name the drector. Other sources cite Giulio Antamoro, with others mentioning Enrico Guazzoni's Quo Vadis? (1913). 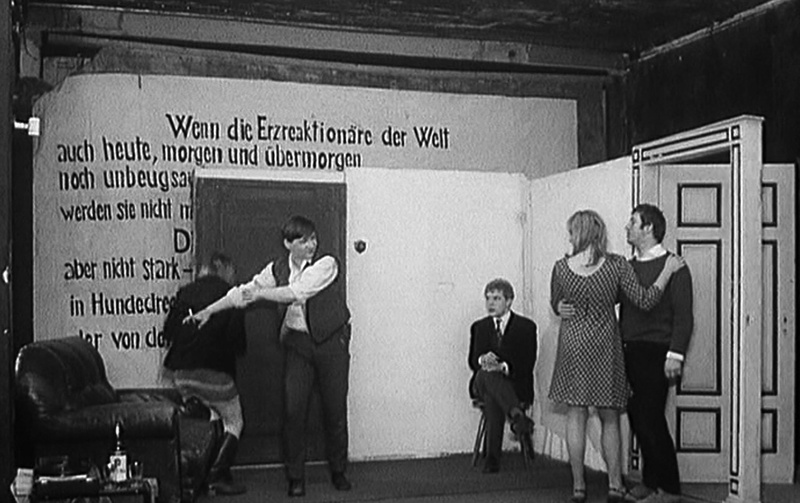 The film is on YouTube several times but usually attributed to Antamoro. It turns out that this mystery isn't quite as mysterious as some of the others in this series. 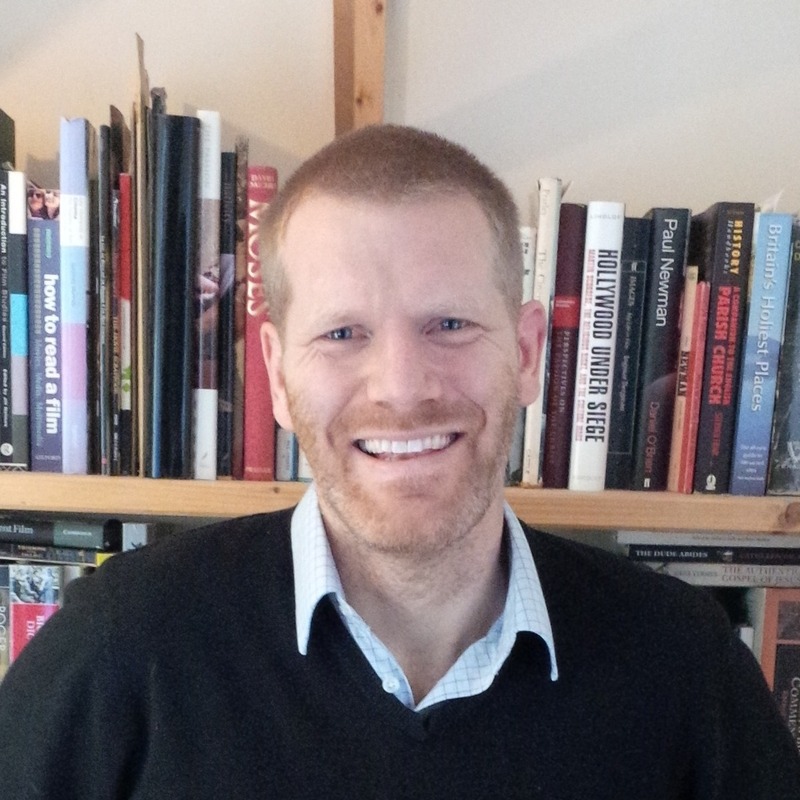 Discussion about a film called Christus is mentioned in a number of sources (Bertellini's "Italian Silent Cinema", Shepherd's "Silents of Jesus", Campbell & Pitts' "The Bible on Film", Kinnard & Davis' "Divine Images" and Adele Reinhartz's "Jesus of Hollywood", all of whom identify Antamoro as the director. Pucci (in Shepherd) names De Liguoro as the director of a different film called Christus (200) and even notes the confusion caused by this Grapevine release, which is different from the one I bought from them over a decade ago (207). Both he and Bertellini (134n38) give the alternative title of De Liguoro's film. La sfinga della Ionio (The Sphinx of the Ionian Sea). A little googling brought up a bit more information about the De Liguoro film (pictured above). 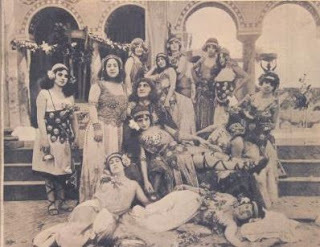 Whilst Rome was fast becoming the film-production capital of Italy, the industry was growing in other regions as well. De Liguoro’s 1914 Christus had been filmed and financed in Sicily. Filmmaking did not start on the Catania side of the Island until 1914 so Liguoro’s film, based on a local legend about a sphinx-shaped outcrop of rocks, was amongst the first shot in the region. It was made under the banner of Etna films, funded by local industrialist Alfredo Alonzo, which targeted their output at the local, upper class market whilst seeking to engage a broader audience (Bertellini, 130). "Christus tells the story of the impossible love of the lustful, corrupt, governor of Syracuse Xenia, for the young Christus, in love with the sweet Myriam, with punctual and atrocious death in the flames of a galley (built ad hoc) of the cruel Xenia, while Christus, together with old Gisio, manages to save Miriam locked up in a well. Meanwhile the protagonist, together with old Gisio, succeeds in saving Miriam who had been locked up in a well"
The article also makes it clear that Alonzo, inspired by Cabiria (1914) earlier in the year pumped a vast amount of money into Etna films, and that this epic was their most costly and spectacular production. In addition to a reputed cost of 300 extras and several major stars there was also the creation of vast sets and a ship for the scenes at sea. Sadly though it seems the film's marketing efforts failed to get any traction, with even the local media underplaying it, and it never broke out to become the European/Worldwide smash that Alonzo/Etna needed to recoup costs. The confusion in this case however seems to be limited to Grapevine video and customers like me. Aside from their case and the surrounding confusion there is nothing else linking De Liguoro with a Jesus film called Christus. Whilst Grapevine no longer seem to sell the DVD set I bought they continue to market a film they claim is De Liguoro's Christus, but according to Pucci's endnote the film supplied is Maître's 1914 Life and Passion of Jesus Christ the subject of Silent Bible Film Mystery #04 (207n1). In summary, then, we have two films. The 1914 Christus, also known as La sfinga della Ionio (The Sphinx of the Ionian Sea),was made in Sicily by Etna films with Giuseppe De Liguoro at the helm. Rather than being a Jesus film however, it's a story from 100 years previously, whose hero (played by Alessandro Rocca) is simply called Christus, though it's biggest star was Alfonso Cassini in the role of Gisio. Then there is the Jesus film called Christus released two or three years later in 1916/1917 was directed by Giulio Antamoro for the great Cines firm. This is the film I wrote about and which has been covered by the other authors listed above. a version of this film, (labelled correctly) is also available from Grapevine, though the print of the film on YouTube is better if you can hack the fairly occasional subtitles being in Italian. Jesus is played by Alberto Pasquali, and it's worth looking at CineKolossal's page on this film, for the sheer number of screenshots and stills (though they date it 1914 which is seemingly date production began). And it turns out that whilst Antamoro filmed most of the picture, Guazzoni did direct a few shots including part of the ascension scene (Pucci 201). 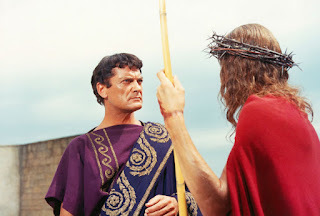 Ponzio Pilato (Pontius Pilate, dir: Irving Rapper and Gian Paolo Callegari, 1962) is best known as the film in which John Drew Barrymore plays the roles of both Judas and Nazareth, though he is uncredited for the latter. In truth his Jesus is largely shot from the rear (or the side as above) save for two extreme close-ups of his eyes in a manner reminiscent of similar shots in the previous year's King of Kings (Nicholas Ray). There are other similarities with Ray's film, the strawberry-blond hair the vibrancy of the red-robe Jesus wears before Pilate and the lengthy sub-plot involving Barabbas and his zealot troops. 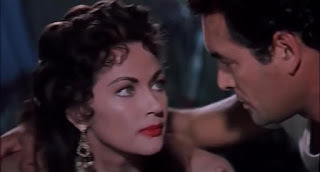 Like La spada e la croce (The Sword and the Cross, 1958), the film sits somewhere between the Hollywood Jesus cameo epics of the 1950s and a typical American Jesus film. Jesus features a great deal more than he does in The Robe (1953) or Ben-Hur (1959) but the story is still mainly about those associated with his life than he himself. This focus on these minor gospel characters seems to be something Italian producers are far more interested in than their American counterparts. At the start of the film it is Pilate who is on trial in front of the Senate, rather than Jesus before the Governor. 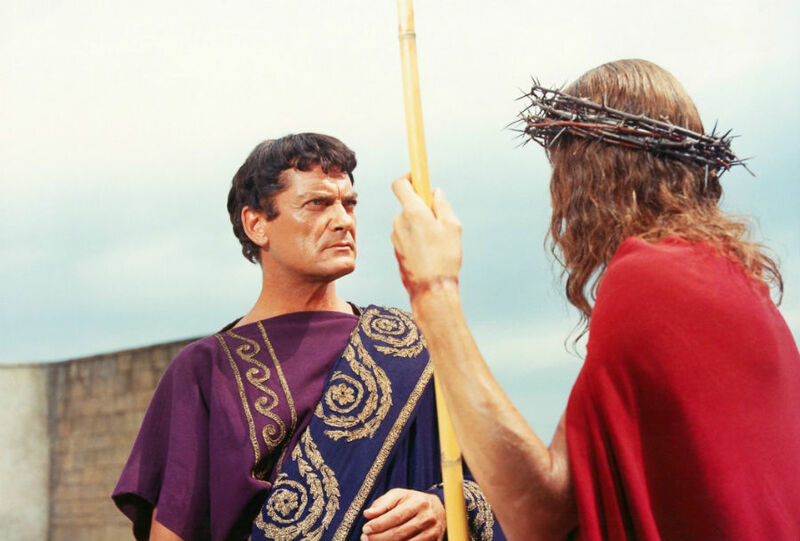 Pilate (Jean Marais) has been recalled to Rome only to find the emperor who brought him to prominence, Tiberius, has been replaced by Gaius. The charge sheet is fairly lengthy, his disregarding Jewish traditions, his use of the Jewish temple tax to build an aqueduct and a charge that he "massacro un moltitudine di inermi che fuggivano sua ingiustizia" (massacred a defenceless multitude fleeing his injustice). This is all reasonably consistent with the accounts about Pilate we find about Pilate in the works of Josephus and Philo, indeed his acuser's summary that "è comporato come un tiranno dimostrando il suo odio al populo Giudeo" (he has shown tyranny and his hatred for the people of Judea by his governance), is remarkably close to Philo's description of a "merciless" man capable of great "wickedness". The historical rooted opening device is not only unusual, but also rather significant in terms of how it frames the rest of Callegari's script. Too often Jesus films have perpetuated anti-Semitism by portraying a weak Pilate being pushed into condemning Jesus by the Jewish people and/or their leaders. The Pilate who we find in these roughly contemporary historical accounts, and indeed elsewhere in the New Testament (Luke 13:1) was a vicious, unpredictable, tyrant, not a thoughtful and impartial philosopher-in-waiting. Framing the story in this way - putting these accusations up front, rather than sneaking them in under the radar, or just ignoring them, has a significant effect on how we view Pilate throughout the film. Sadly that historical credibility is rather undermined by the filmmakers next move however as Gaius whips out the sign that Pilate had nailed to Jesus' cross all those years ago and repeats the argument assigned to Caiaphas in John 19 that calling Jesus King of the Jesus amounted to treason, for the king of the Jews was Caesar. (We'll leave aside the unlikeliness of a sign nailed to a cross in a backwater in Galilee finding it's way, 10 years later, to the highest authority in the land). In answer to this, Pilate further heightens the parallels between his trial and Jesus' by remaining silent rather than answering his accusers. There then follows a flashback to the incidents leading up to Jesus' execution which comprises the rest of the film, beginning with his arrival in Jerusalem. There's an attack by the zealots leading to the new prefect getting shot in hand with an arrow, a foreshadowing of the blood on his hands for Jesus' execution. Pilate quickly gets up to speed with the varied politics of the locals, from the sympathetic Nicodemus, who we wait to bloom into the character Jesus encounters, but who never quite gets there; to Basil Rathbone's relatively sympathetic and flexible Caiaphas; Gianni Garko's amiable rebel Gionata; through to the zealot hardliner Barabbas. There's also a rich and influential money man Aronne Ec Mezir and his beautiful daughter Sarah (Leticia Roman) whom Pilate falls for and has an affair with early in the picture. The main elements of the plot though, do rotate around what the ancient sources, including the Bible, have to say. The construction of the aqueduct found in Josephus (Antiquities 18.3.2) and the troubles Pilate has with it takes up a lot of screen time early on and is always on hand for whenever the filmmakers need a dramatic al fresco Roman-looking backdrop. Not that the film is short of these, the impressive landscapes and the impressive looking sets give this film an epic feel. Another element from history that drives the plot on is the Jewish protestations at the Roman standards which Pilate erected in the temple precinct (Josephus Antiquities 18.3.1). 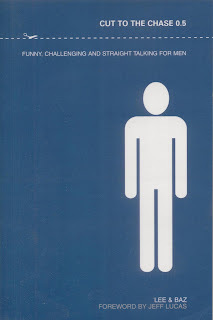 Whilst this incident occurs in a number of Jesus films the version here seems to have influenced Roger Young's Jesus (1999). Faced with a high profile star to play Pilate (Gary Oldman) and the desire to put the blame for Jesus' death closer to Rome's door than Jerusalem's the incident is a great opportunity to put a bluster-filled Pilate in context. Various shots of this incident in Rapper's film also seem to have closish reproductions in Young's. 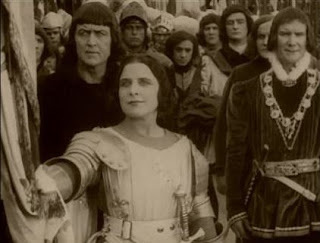 What is surprising though, given the opening to the film, is the way that Callegari's script uses these incidents to portray Pilate in a positive light. His desire for the hated aqueduct is to enable better irrigation for the region's poverty-stricken farmers. The eagle standards are only erected because Barabbas is beginning to run riot over Judea. A decisive moment occurs just before the film's halfway point. Pilate's wife Claudia returns to her adulterous husband having heard Jesus' teaching on forgiveness and turning the other cheek and she begins to influence him for the better. This moment is contrasted with the following scene where the Jewish Sanhedrin vote to oppose Pilate with violence. They are not aware of the words Jesus has been speaking moments before, but they, too, recite the "Eye for eye, tooth for tooth" passage from Exodus 21:24. Unlike Jesus they accept it rather than refute it. Caiaphas, whose usually towering head wear is a little more practical here, seems to secretly disapprove of this course, and it's unclear what we are to make of the Jewish council voting to fight back in this way. At the very least it represents a parting of the way with Jesus' message of peace. Parts of Jesus' teaching are scattered throughout the film. There's an odd moment early on when Gionata's friend Daniel recalls his personal and life-changing encounter with Jesus on, of all places, the Road to Emmaus. Jesus has healed him, and his predicts salvation at the cost of persecution. Claudia hears him speaking on the shores of Lake Tiberias. Later we hear one of his disciples sharing the beatitudes and recounting the story of Lazarus shortly before Barabbas kills him, quoting "turn the other cheek", and sacks the village where he was speaking. But whereas the biblical material in the first hour of the film is largely incidental, in the final 30 minutes it forms the primary narrative. Aronne Ec Mezir increases the reward for capturing Barabbas and he finally gets arrested. With him seemingly out of the way, it is the teacher from Nazareth, fresh into Jerusalem and causing chaos in the temple, who becomes the authorities' biggest problem. 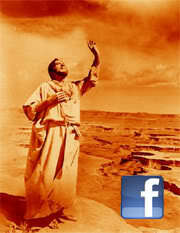 The difficulty is, however, that compared to Barabbas' antics, Jesus' minor disturbance seems very mild in comparison. When one of the Jewish leaders says "il sinhedrio non perdonerà il tuo Nazareno di aver scacciato i mercanti dal tempio" (The Sanhedrin will never forgive your Nazarene for driving the merchants out of the temple) it comes out of nowhere. The next shot sees Aronne Ec Mezir approach Judas and manipulate him to handing-over Jesus. Judas then appears after the Last Supper but doesn't convincingly betray Jesus. Jesus appears before Caiaphas but the high priest has neither the motive nor the passion to hand him over to Pilate. Pilate offers him to the crowd as an almost sarcastic riposte. Barabbas has been terrorising his own people as well as the Romans. He even sees Jesus' eyes reflecting off the water he uses to wash his hands of the affair, and yet still condemns him. The crucifixion is interesting for two reasons. Firstly because like Barabbas (1961) it features footage from an actual eclipse, although the shot of the moon/sun is rather unconvincingly spliced in between the footage of crosses on the hill in the dark. This is a tactic the film uses elsewhere - a scene of crocodiles eating the unfortunate losers in a boat-based fight-to-the-death similarly seemed to use stock footage. But the moment of Jesus' death is also interesting because of the scale of destruction due to the earthquake accompanying it. As I have argued before scenes of spectacular destruction are one of the defining characteristics of the biblical epic. However, this is generally for the Hebrew Bible epics and the Roman/Christian epics, the tendency is far less prominent in those films based on the gospels and I can't think of another that has quite the scale of material destruction at this point in the story. As with many epics is implies divine judgement so it's curious to find it occurring at the moment when God's mercy was meant to be being unleashed, rather than his judgement. The question though remains: who is the object of this judgement? The film struggles to suggest anyone person or group bore the responsibility for Jesus' death. Given the unfortunate history of Jesus films continuing the tradition of blaming the Jews for Jesus' death it's perhaps not the worst thing in the world for a film to struggle to find anyone to blame.The nature of the film requires a sympathetic Pilate. History, perhaps, requires a sympathetic portrayal of the Jewish population as a whole (and a sympathetic portrayal of Judas in particular). Rapper (who was Jewish) and Callegari really deliver on this - the diverse range of different, generally sympathetic, Jewish characters with their different beliefs and ways of putting those beliefs into action is certainly very worthy even if it doesn't deliver in other areas. Ultimately the action returns to the senate, with Pilate standing before the assembly saying he will be judged by "la giustizia del regno dei cielli" (the justice of the Kingdom of Heaven). Like history and, indeed, theology, Pilate's fate is left open ended.